The crazy thing about this is that too much ppl are making this an issue. If a female opt to sleep with another female, that's her choice (most ppl are ok with this actually), if a dude opt to sleep with another dude, that's his choice (this is where the hypocrisy mostly lies). What is good for the goose is definitely not good for the gander with you people. And that's where I, a str8 man, have an issue. Personally, I have a general indifference to the topic, but again, the hypocrisy pisses me off to no end. I have friends, gay and str8, and the ONLY difference with them is their sexual preferences. Preferences!!! Just like how some of you prefer to have a steak medium well and some prefer well done. You try different things and figure out your preference. I don't see ppl quoting bible scriptures about how to eat meat...then again, you quote the bible saying not to. Anyway, back to the hypocrisy...you rightly reference Lev. Chpt. 20 v 13...but somehow neglect to mention all the other sins and punishments mentioned in that chapter, specifically v 10 that refers to adultery. You people condone one sin and defile another. Sin is sin. Faster you recognize that, the better off you'll be. I say all that to say this, if it's your thing, cool, do what you need to to make your happy. If it's not your thing, keep it moving and leave the damn people alone let them live THEIR lives how they see fit. The earth is already over populated - how hard do you want the world to become for you Grandchildren, Great-grandchildren? Money hungry pretender going with the flow preacher can't run them out of my church because they brining in millions to make me look good and feel good so what the hell back them up yes. Hell are going to have more saints than sinners. TD Jakes...FREEDOM, the Overarching System (the ‘god of fortresses’?) that Protects Unique Nuances. ..."...Once you begin to understand that democracy, that a republic actually, is designed to be an overarching system to protect our unique nuances, then we no longer look to public policy to reflect biblical ethics." ..."The church should have the right to have its own convictions and values; if you don't like those convictions and values and you totally disagree with it, don't try to change my house, move into your own ... and find somebody who gets what you get about faith." 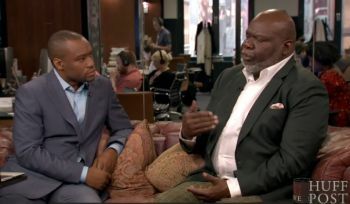 It is clear that Mr. Jakes believes in, defends, and glorifies the righteousness of FREEDOM of Self-Rights….which in this discussion revolves around freedom of sexual lifestyle and religious freedom. He has very clearly justified in his eyes the “goodness” of the democratic (self-ruling) system, outlining that it acts as the “overarching system”, ie the authority above all other authorities, that protects the nuances , the differences in the variety and preferences of personal beliefs, whether they be sexual or religious. In other words, this “ overarching” acts as the ‘god of (above) all fortresses’. It is written in Daniel, that the last king of the north will glorify and advance his “god of fortresses”. What is the one belief, amongst all nations, peoples, religions, lifestyles, that is common to all? What one belief is embraced, desired, and glorified by the small and the great, by the rich and the poor, by the free (employers) and by the bondmen ( employees)? What is the one belief that is marked as a sign of allegiance on everyone’s forehead and hand? Is it not the love for FREEDOM...for freedom of self-rights, freedom of self-religion, freedom of self-happiness, freedom of sexual lifestyle? Mr. Jakes has clearly shown that he places this FREEDOM as the overarching way of life above all other beliefs, thus subsequently placing the Son of the One Creator, the Lord Jesus Christ, below this “FREEDOM” and consequentially categorizing HIM to be of EQUAL validity to ‘other gods’. This FREEDOM dictates that it is RIGHT, a right, to be free to worship ANY ‘god’ as per one’s self-justified desires, establishing this to be “good” in one’s own eyes. BUT the One Creator said that man is not to worship any other gods. In other words HE said that man is NOT FREE to worship other gods, warning man that if he were to do so the judgement and penalty for this taken-freedom, for this disobedience, would be death. The Lord Jesus Christ, Son of the One Creator, said the we are to worship ONLY the One Lord your Creator God and HIM Alone to serve in obedience and love, love for HIM first and foremost and love for, to do GOOD according to the One True Way, to the fellow man. Very soon, the Lord Jesus Christ will return, as a thief in man’s eyes, to rule the earth in obedience and power as the ONE KING according to the Will of ‘I AM’ and NOT according to man’s first love for “his overarching freedom “, for his desire to serve and magnify oneself (XES). ...and the Lord Jesus Christ will say, to those that hypocritically and theologically claim “biblical ethics” in His Name, that “ I do not know you, workers of lawlessness”. The Lord Jesus Christ said to repent and to serve Only Him, for He is the One True Way of Life. An obvious buffoon: What is his AIM? Is it selling his book? I think so, it's all about greens not winning souls for God, but what will it profit him to gain the world and lose his soul? Affirm person, not lifestyle. TO will be judged for his politically correct comment.